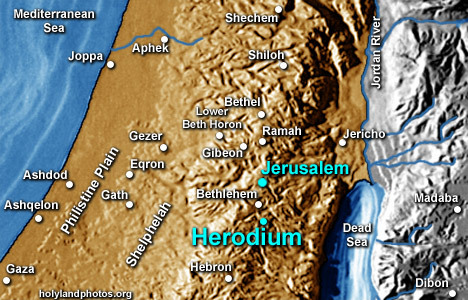 The Herodium is located 7.5 miles south of Jerusalem. It is about 3.5 miles southeast of Bethlehem. According to Josephus, a Jewish historian, it served as a palace/fortress for Herod the Great. Herod was buried here in 4 B.C. Later the Herodium served as a base for Jewish rebels during the first (A.D. 66-70) and second (A.D. 132-135) revolts against the Romans. See Josephus Wars. 1.21.10 [419-421] and Ant. 15.9.4 [323-325] for descriptions of the Herodium as a palace/fortress and Wars. 1.33.9 [670-673], Ant. 17.8.3 [196-199] for the burial of Herod. To view the recently found (May 2007) "Tomb of Herod" Click Here. For several articles on the Herodium see the Biblical Archaeology Review vol. 28, no. 2 (March/April, 2002) and Ehud Netzer "Jewish Rebels Dig Strategic Tunnel System." Biblical Archaeology Review, vol. 14, no. 4 (July/August, 1988):18-33.